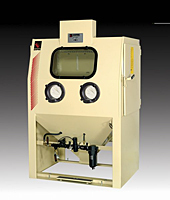 Empire’s testing and product demonstration facility is unexcelled by any other manufacturer of air-blast finishing equipment. The lab houses a comprehensive list of equipment purposely selected for prototyping, validation and process optimization. ABB Robotic Air-Blast System – Features roof mounted 6 axis robot and coordinated 7th axis part rotation. 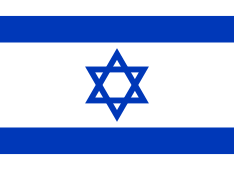 The system is capable of manipulating both the part and nozzle. 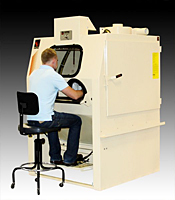 FANUC Robotic Air-Blast Cell Machine – Features pedestal mounted robot and 7th axis part rotation. The system is capable of manipulating both the part and nozzle. 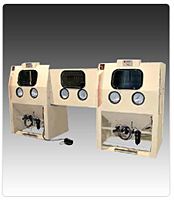 Automated Cell System – Features vertical oscillation and part rotation and is setup for pressure or suction blasting. 6060 RS with turntable – Features nine gun rotary technology. IL885 – Features pass through processing with both fixed guns and horizontal oscillation. 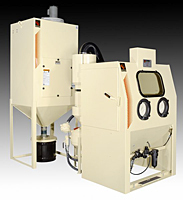 BB4 – Designed to batch process small to medium size parts and is outfitted with the flexibility to blast with either pressure and suction. 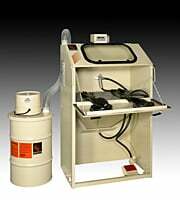 3642 ProFormer ™ – A self-contained “drop in place” system that require only two connections, air and electrical, and includes features offered in our high production Pro-Finish® line. Empire’s Product Support Managers have years of experience in evaluating the many ways to blast and peen almost any part. 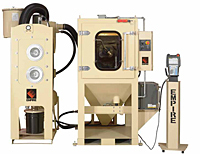 The best way to determine the right solution for your unique finishing and production requirements is to send parts to Empire.